Godhumai maavu (Wheat flour) vazhai elai (plantain leaf) adai recipe comes from my mom’s kitchen Recently my mom had seen a cookery show in Vijay TV. She was so much impressed by this easy recipe that she tried it immediately and sent to me to be shared with all my readers (Thanks mom…so sweet of u!) Am posting this recipe as narrated by my mom. Am sending this recipe to Srivalli’s “Mithai mela” event! Mix wheat flour, grated coconut, jaggery and elachi powder. Add adequate amount of milk and make a soft dough. Cut the vazhai elai (plantain leaf) into small square pieces. Take one piece of vazhai elai, apply ghee on it. Spread the dough ball on this greased vazhai elai. 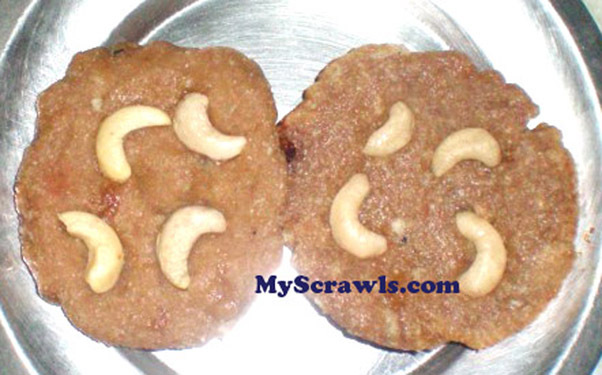 Place one or two cashews on it and close it with another greased vazhai elai. Similarly spread all balls on the greased vazhai elai. Place all these on idly plate and steam cook it for 4-5mins. Godhumai maavu vazhai elai adai is ready. As the dish is steam cooked with vazhai elai it is very good for health and also will be very yummy. Hey… Wow!! was off this site for a little while and guess what happened… so many people came by here… and our very own Chef Anu has graduated and is on to fetch a doctrate in Cooking… So many mouth-watering recipes !! This blog has really come alive… kudos..!! wow.. looks nice & YUmmy… great entry..
Thats a delicious dessert. love it. sorry for the delay in leaving comments. Might be a challenge to go looking for plantain leaves here for me, but I am sure they taste awesome the authentic way you made. Looks wonderful ..thanks for the entry! Anu…this looks very tempting, any chance of making this without the plantain leaf? Can make the dough watery enough so that I can make it like a regular dosa on a tava? Mmm… havent tried without plantain leaf. I guess its a very popular dish in Kerala! Am sure you make it as sweet dosa too. My aunt makes a similar recipe, I will find out and let you know.